Hi-de-ho. Time for another update. All of the construction is complete except for the tools on the hull, which will be added after painting is completed. As before, everything has gone together without a hitch. The parts have been cleanly molded with little to no flash, and I have had no fit problems at all. Here is a pic of the turret before I closed it up. And here is everything prior to priming. So, after I get this posted (or shortly thereafter) I am going to get it primed so I can start painting. Time for some more Honey. Thus far, the kit is going together nicely. Nothing weird as far as fit, and seam lines and such are not bad. I primed the inside of the lower hull and inside of the upper hull using Vallejo black primer. After that dried I sprayed the inside with Vallejo RLM 76, Pale Blue Grey. I then sprayed a light layer of Vallejo white. I painted some of the details inside and installed the radio and ammo cans on the sponsons. Then I gave it a wash of ultra thin Model Master flat black. After everything dried, I installed the rest up the upper deck details, except for the tools. I like to do those after the basic colors are down for ease of painting. Then I weather it all together. So, that’s it for this time. 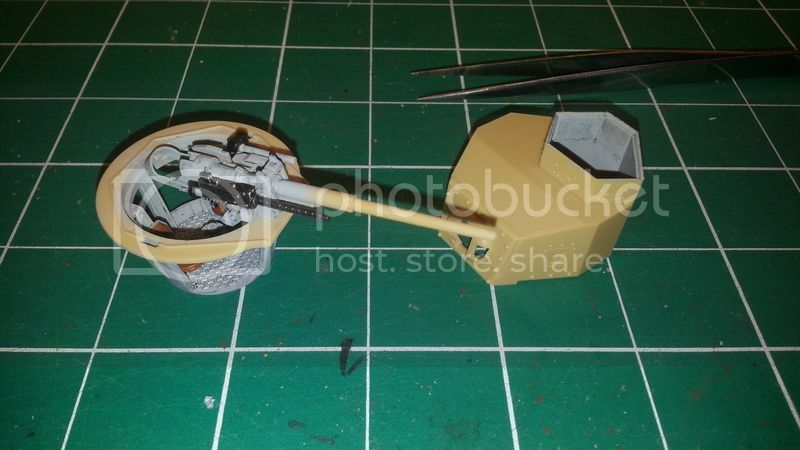 I will be tackling the turret next week and will post more shortly thereafter. The current topic on the Sprue Cutter’s Union (SCU) is Your Stress Free Build. I am pretty limited in the scope of my modelling endeavors. Mostly armor, with a sprinkling of aircraft. But, for pure relaxation and stress free modelling, tracked armor is my favorite. Tanks, specifically WWII tanks, to me, are the very reason I stick with this hobby. Tanks are what first got me “serious” about modelling. By “serious,” I mean building a kit with care, and painting it. I find them to be enjoyable to build for a number of reasons. 1. There are wide variety of tank types to be built. 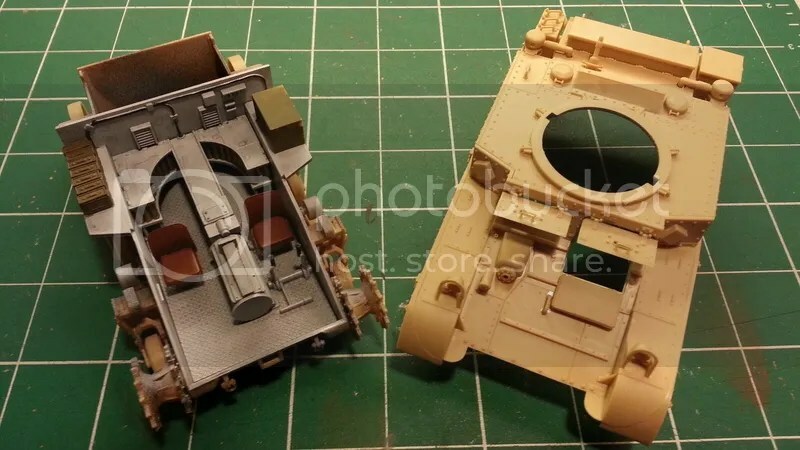 I really believe a person could focus solely on the Sherman variants alone, for example, and have a hard time running out of different subjects to build. 2. Painting them is not as tedious, or difficult (in my opinion, at least) as aircraft. By their very nature, they lack consistency and uniformity, in colors and camouflage. Therefore, there is a little more leeway as far as accuracy goes. 3. Since tanks were home for the men that operated them, the possibilities are endless when adding extra stowage and gear. 4. 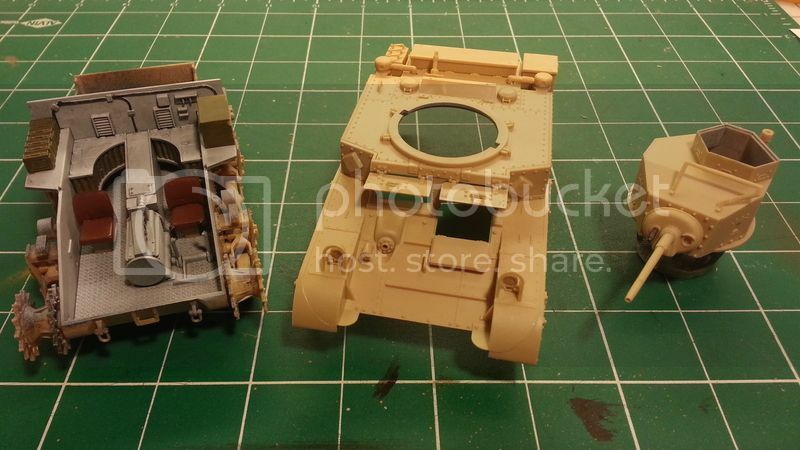 The vast majority of tank models are in 1/35 scale. This scale is a perfect balance of size and detail. A completed 1/35 scale tank fits nicely on a shelf. Most modern kits include plenty of detail and with new molding technologies, even the molded on detail can look very good. 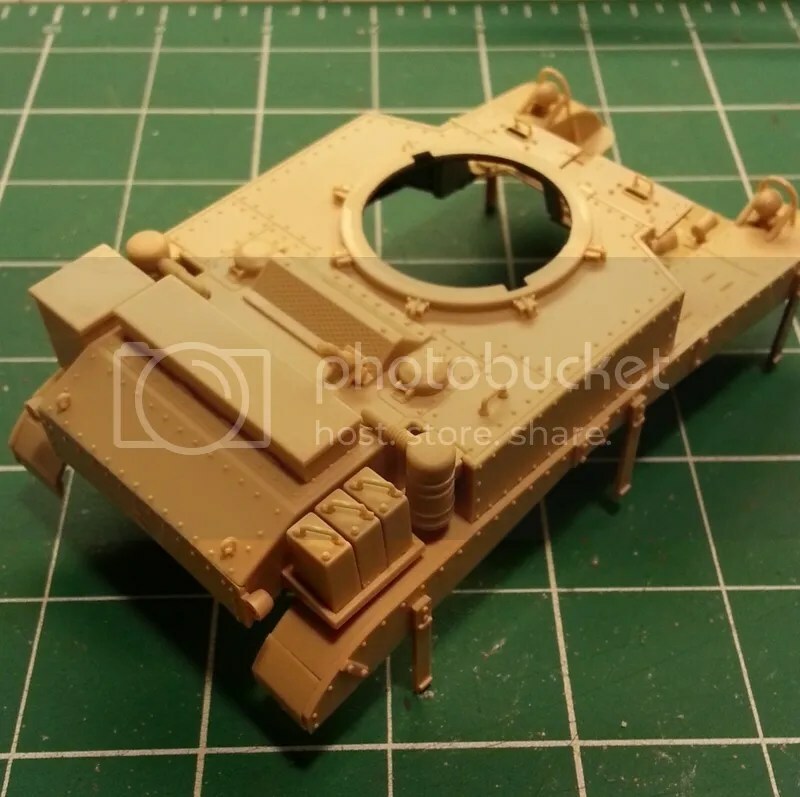 Scratch building and super detailing are possible for even the less experienced modellers. And figures can be added in this scale that are big enough, that with some practice, one can add some very convincing life to an otherwise static vehicle. 5. There aren’t as many seams to fill like there can be on aircraft, and even if there are, I don’t have to worry about panel lines and tiny rivet detail getting destroyed when I smooth out the filled areas. I think the above factors coupled with the nostalgic feeling I get when I build a tank, especially one that I built when I first started with them so many years ago, is what makes this hobby most enjoyable and stress free for me.